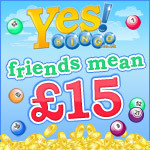 Friends Mean £15 at Yes Bingo | Yes Bingo! - The UK's best online bingo site! Claim £10 Free No Deposit Bonus. There are many reasons why you should introduce your friends and family to Yes Bingo. Firstly, having your friends and relatives play at the same bingo site as you is the perfect way to enhance your playing experience. You can stay in touch with friends, gossip in the chat rooms, and experience the thrill of bingo wins together. But perhaps the most exciting thing that happens to you when you spread the word is the £15 bonus you get for every friend who deposits at least £10. This is one of the most generous free bingo bonuses you get for referring a friend anywhere in the online bingo industry. Here’s how to make the most of this exceptionally generous bonus. Work through your e-mail contacts, your mobile phone contacts and other bingo contacts. Tell them the gossip about Yes Bingo — they get a £10 no deposit bonus for joining, a 350% deposit match, tiny ticket prices, plus access to 30, 75, 80 and 90 ball bingo. Also, you could entice them with the potential big wins — a huge life changing fortune could be just around the corner. With numerous progressive jackpots to chase, and slots and side games galore, they will have no problems saying YES to Yes Bingo. Spread the word and start to earn.